Displaced people (homeless, refugee, etc.) face a multitude of unique issues that stem from being constantly on the move. Guided by the principles of sustainability (environmental impact) and economy (low labor cost) and with research supplemented by consultations with both displaced people and agencies that work to serve them, I set out to design a solution to a pressing problem facing refugees resettling in Rhode Island face during the transitional period. After consulting with DIIRI, the local resettlement agency, I learned that one significant complication facing refugees in Rhode Island is the startling adjustment to a new climate. Most of them hail from warm climates, so they are not used to wearing heavy layers or appropriate shoes during the winter. DIIRI has a room filled with donated clothes with plenty of coats, but oftentimes clients will forget to put them to use or will sometimes even refuse to wear them at all. As a result, they get sick or even hurt trying to go about their daily lives, which only makes the transition even harder. Many of my design decisions were inspired by biomimicry. I chose the dragonfly as my muse because it is the animal kingdom's longest distance traveler. Everything about their anatomy serves the purpose of making flying as easy as possible, adapting as necessary. One thing I noted in particular was their ability to maintain and adjust their body temperature. In order to warm up, dragonflies will bask in the sun with their abdomen facing the sun (lying horizontally and upside down). In order to cool down, dragonflies will do a handstand, raising their body while the abdomen faces the sun. Dragonflies can move each wing independently in 4 different directions and use the surface area of their wings as shade from the sun — essentially, dragonflies are very adaptable, no matter the climate. Although I did not ultimately choose to focus on the demographic of homeless people, part of my research did involve consultations with employees and clients at Amos House, a local shelter. From them I learned that the most effective designs would be ones that could be added onto something that they already own and ones preferably targeting the extremities (hands and feet). Taking that into consideration, I continued my biomimicry into investigating where heat loss is the most severe in the (human) body. It turns out to be the chest, neck, and upper back. That is relatively little surface area, so I started designing something small enough to be slipped into any generic piece of clothing while still covering the areas of the body that needed to retain the most heat. I did some research into different tech fabrics to find material that could absorb and/or conserve heat from the sun and/or the body. There are plenty of options, but this solution would be far too expensive for a local resettlement agency to buy in bulk. The solution to a heat-retaining and inexpensive fabric turned out to be the emergency blanket. This mylar fabric can be found in most first aid kits, costs only a few dollars, and retains up to 90% of body heat. If the mylar took care of the most important areas of the body, then maybe the rest of the body could continue wearing the lighter clothing that the client is used to while they become adjusted to the new cold environment. It's one thing to not be used to a type of weather, but another thing to have to also adjust to a new wardrobe and culture. This undergarment can be used as another tool (like art) to ease the resettlement process. 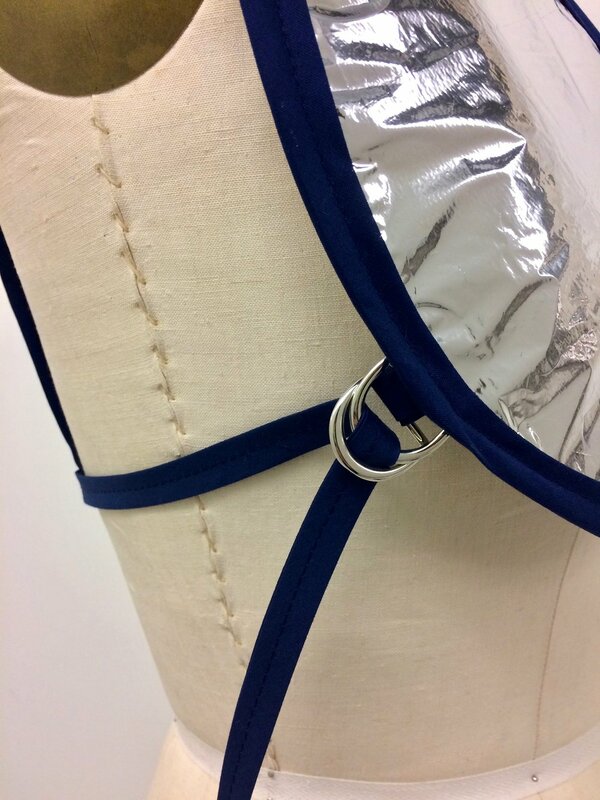 In order to be easily attached to every garment, there are strips of velcro on the shoulders (because the shoulder seam is one of the few constants across styles), and the D-rings on the righthand side adjust for size. A layer of felt or foam can also be added for more heat conservation and weight. Finally, these vests can be distributed either already placed inside garments by employees in a donation center or folded up and distributed in bulk.